The life of a hard-working doctor, who is usually able to separate his work (where he sees death every day) and life outside the hospital, is thrown into turmoil when his mother is hospitalized which cancer in the same hospital where he works. 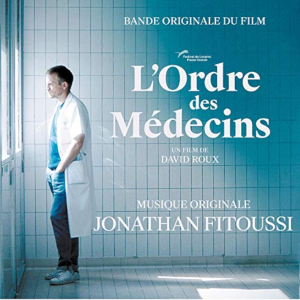 L’Ordre des Médecins (Breath of Life), the directorial debut of French filmmaker David Roux, features an electronic score from fellow Frenchman, Jonathan Fitoussi. The musical approach by Fitoussi seems to be to allow what’s happening on-screen to dictate the emotional drive of the movie: the score is very much based in the camp of setting down a musical environment in support of the story. The majority of tracks sets out an idea – usually some sort of pleasant, repetitive synth rhythm within which there’s some accompanying flourishes and then to go with this for a couple of minutes. This basic plan is then used again and again for the duration of the score with only slight variation. The main theme which opens the album is the nearest we get to a recurring theme and recurs at several points during the album’s playing time (just short of 30 minutes). It’s a nice catchy musical idea but, without much variation, when it plays it’s…just there. Fitoussi’s choice of synths is good with most of the electronic elements being ‘organic’ in nature (rather than the harsh, piercing electronic than can populate more aggressive electronic scores) and this choice adds to the score’s (limited) enjoyment potential. L’Ordre des Médecins is a score that shies away from ambition, but I am sure it works well for a movie concentrating on personal relationships where a more exuberant soundtrack would be intrusive or overly melodramatic. A couple of more ambient tracks that focus more on meandering synth washes of sound add a bit of variety.